For more than two decades, Bibleman and his trusty sidekicks have been sharing the Truth with kids and using God’s Word to fight fear, despair, pride, and a myriad of other issues along the way. 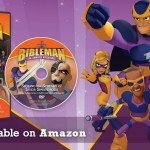 Through the years, the Bibleman® series has seen a variety of characters, actors, hairstyles, and different colors of spandex, but its mission has always remained the same: share God’s Word and teach children to rely on Him at all times. Though being released in an animated format for the first time in October 2016, the Bibleman® series started as a live-action production. Pamplin Entertainment launched The Bibleman Show (1995–1996) with four episodes starring Willie Aames in the title role of Bibleman/Miles Peterson, a successful man who was frustrated with his life. Once introduced to God’s Word, he realized there was more to life and worked to share God’s Word and fight evil. The Bibleman Show was a new and creative way to share the Gospel with children through the use of action, adventure, and music. The title was soon changed to The Bibleman Adventure (1998–2004), and several fun characters were added. Bibleman got a sidekick when Coates (Marc Wayne), Bibleman’s best friend, joined the cast. Cypher (Brady Williams) replaced Coates in 1999. Brian Lemmons played one of the series’ most memorable villains when he arrived on the scene as the evil Luxor Spawndroth, bent on destroying the Bible Adventure Team and keeping children from knowing God. 2001 saw the introduction of Biblegirl (Tracy Henao, followed by Heather McSmith in 2002.) Jef Scott brought creativity and fun to the show with his many wacky, zany villains. Though the cast was different and the title changed, music and action continued to help the Bible Adventure Team spread God’s Word to all who watched. In 2004 Willie Aames hung up his cape and spandex to make room for a new Bibleman. That’s when former children’s pastor Robert T. Schlipp joined the cast as Bibleman/Josh Carpenter. Shortly after, Tommy Nelson took over production and added the final member—Melody (Lindsay Lewis Benner), Biblegirl’s cousin—to the Bible Adventure Team. The newly titled Bibleman: Powersource featured the Bible Adventure Team fighting all manner of evil villains in order to proclaim the truth of the Gospel to children and their families. Shortly after the series’ first name change, various members of the cast began touring the country in live versions of the show. Shows were performed coast to coast in the US, at multiple Franklin Graham Crusades, two Billy Graham Crusades, and even in Germany. Through the use of daring illusions, action-packed battle sequences, original music, and the Sword of the Spirit (the Word of God), audiences across the United States were reminded that God is on our side and that with His help the enemy will be defeated. Thousands of children, parents, and grandparents responded to the invitation at the live shows and made professions of faith. 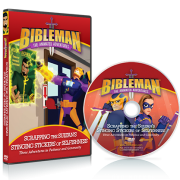 As the latest installment of the Bibleman® series hits shelves, the Bibleteam may look different, but they are still dedicated to sharing the truth of Christ with all those who are willing to hear. With new voices, a fresh look, and more evil villains intent on keeping children from knowing God, a new generation of families is sure to enjoy this adventure and learn Scripture together. 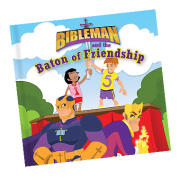 Your family can be part of the action with Bibleman® DVDs, books, and toys, available here at the Bibleman® website.